Quite often web-developers don’t care enough about errors. If something goes wrong, you often see default Laravel texts like “Whoops, something went wrong” or, even worse, the exception code, which is not helpful at all to the visitor. So I decided to write a step-by-step article of how to handle errors in elegant way and present proper error information to the visitor. As a side-note: this article will also show an example of creating your own Service with Dependency Injection, and handling exceptions thrown by the service. So we have a really simple example – a form to find a user by their ID. Ok, so this is our ideal scenario. But what if the user is not found? Or, of course, we can set .env file with APP_DEBUG=false and then the browser will just show blank Whoops, looks like something went wrong. But that still doesn’t give any valuable information to our visitor. Another quick fix we can make is using User::findOrFail() instead of just find() – then if user is not found, Laravel would show 404 page with text “Sorry, the page you are looking for could not be found.”. But this is a default 404 page for the whole project, so not massively helpful to user, is it? So we need to catch the errors, process them and redirect back to the form with actual understandable error message. For now, we’ve taken a really simple example of one action in controller – just finding the user. In real application it gets more complicated – usually controller is calling some kind of external service or package method which may fail with different kind of errors. Let’s create our own service which would essentially do the same thing, but would throw exception, so controller wouldn’t even have to know the message text. If you are not familiar with dependency injection and how Laravel IOC container works, here’s official documentation or a good article about it. Notice that we can use $exception->getMessage() again, and all the error validation or message logic is happening within the service – that’s one of the purpose, to separate these actions, controller shouldn’t perform it. Nothing here, right? Let’s fill our exception with some logic. report() is used if you want to do some additional logging – send error to BugSnag, email, Slack etc. So, that’s all I wanted to show you about Exception handling and also using Services, as a side-note. I understand that my example is really simplified, and other people could use Exceptions in a different way, but I hope this article will give an overview of exceptions in general, and reasons WHY you should use them, to show errors to the visitors in elegant way. nice article, learned a thing or two. Just a small note – it’s considered a bad practice to extend your custom exceptions from top level Exception class – it’s advised to rather extend one of lower level ones (http://php.net/manual/en/spl.exceptions.php). In this particular example, I would perhaps extend the ModelNotFoundException itself. Thanks for the comment, Peter, really valuable! Yes, I agree, maybe this exception does look like ModelNotFoundException, but the goal was to show how to create custom exceptions in general. Bad example, perhaps. First off I want to say thank you for taking the time to write this article! I have a couple of questions regarding exceptions and the service class. The initial function has 2 lines of code whereas the function that implements the exception handling has 7 lines of code. Is there a way to move the try catch block outside of the search method so that the method can remain at 2 lines of code ? Another thing that I find unclear is how do I decide which piece of code is best suited for a Service class. I usually use Service classes to store uploaded files or manipulate the request data so that I can persist it in the database, I avoid putting database related code in service classes though. Is everything a service ? 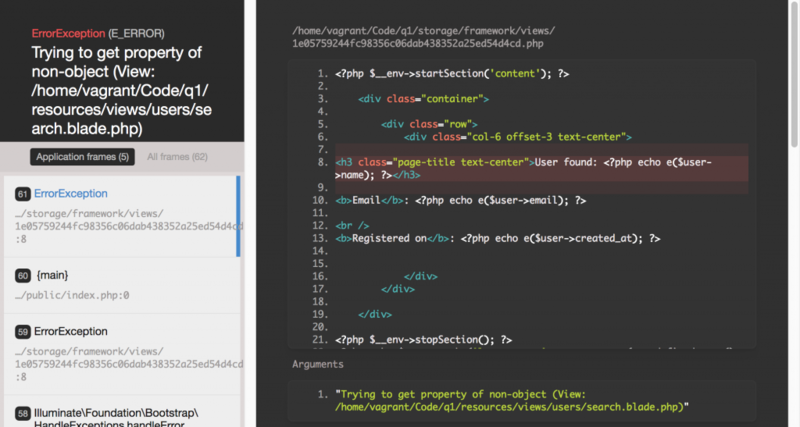 7 lines of code vs 2 lines of code – there’s actually a way to “hide” it from controller, rendering exceptions in Laravel’s Handler.php. And in my case the code seems bigger, in real-life projects is more like 50 lines vs 45 lines – not that significant. Service classes and code structure – I’ve analyzed a lot of codebases and concluded that there are hundreds of ways to structure, and everyone does what’s best for them individually. My take on this – is that service should take any logic unrelated to routing (which should be in controller) and model properties (settings, relationships, appends etc). I am not much familiar with the exception handling so please pardon me if am wrong. My doubt is, while using our own Exception Class(UserNotFoundException) how does laravel knows our custom exception is occurred from the following code? Don’t we need to throw it? or laravel automatically find the exception and throws it? Excellent article, but I have a doubt, is it correct that the service is in charge of showing the view? Would not that be the controller’s job? I speak from ignorance. Greetings. Where in my article I mentioned that service is showing the view? You’re right, it’s controller’s job. Thanks for this article. Handling exceptions this way definitely improves user experience.